Shah had not recovered completely, said local BJP unit. New Delhi: After addressing a rally in Malda, West Bengal, Bharatiya Janata Party (BJP) president Amit Shah on Tuesday decided to return to Delhi. He was to address rallies in Birbhum, Jhargram, Nadia and South 24 Parganas as well but ill health forced Shah to cut short his visit to the state. Confirming the same. BJP’s West Bengal unit president Dilip Ghosh said the rallies would still be held as per the schedule with Smriti Irani replacing Shah for some of the rallies. “Amit Shah will fly back to Delhi. The four other rallies will be held as per schedule without the (BJP) president. While I will lead the rally in Jhargram, the rally in Birbhum will be led by senior leader Smriti Irani,” said Ghosh. Sources in the state BJP said Shah hadn’t completely recovered from swine flu and had high fever even when he was addressing the Malda rally. He was admitted to the All India Institute of Medical Sciences (AIIMS) in Delhi last week after being detected with swine flu. Meanwhile, Irani would lead two rallies at Nadia, South 24 Parganas district on January 24. Before heading for Delhi, Shah declared in Malda that he had come to “sound the bugle for 2019 polls”. “I am here in Bengal to sound the bugle for 2019 polls. The country’s future depends on this election and most importantly, Bengal’s future depends on this election. We will dethrone Trinamool Congress. 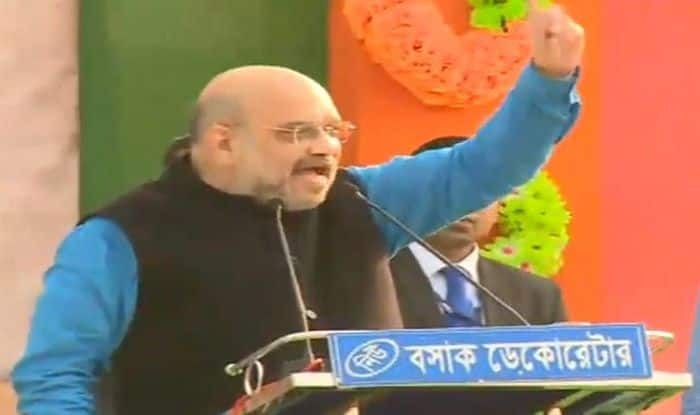 Trinamool Congress is stopping BJP from taking out the Rath Yatra,” said Shah, launching an attack on Chief Minister Mamata Banerjee-led Trinamool Congress. Apart from this, Prime Minister Narendra Modi’s Brigade rally, scheduled to be held on February 8, has also been cancelled. However, the Prime Minister will be holding three other rallies in West Bengal in January.